Pressed Juices Master cleanse is perfect for those of you who are health enthusiasts and are experienced in juicing! 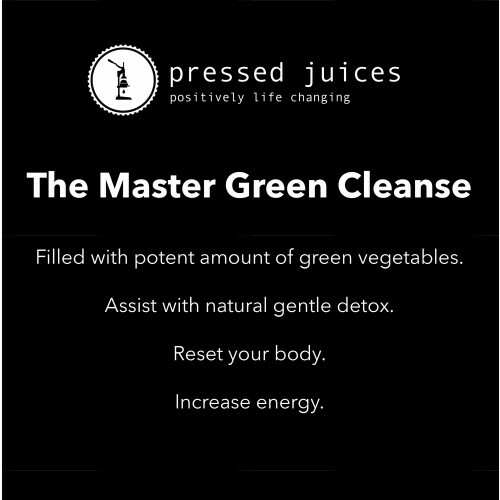 Absolutely bursting with green vegetables our master cleanse provides you with significant amounts of vitamins and minerals giving your body the cleanest cleanse available. We focus this cleanse on greens due to the number of extreme benefits. Our green juice range offers a number of different flavors and is known as the multivitamin in a bottle! With high amounts of green vegetables this cleanse will provide your body with sufficient nutrients to deliver energy production, increase calcium and maintain optimal ph balance for your health. The master cleanse is also low fructose which provides the body with reduced amounts of natural sugar helping to decrease cravings, kick those bad habits and enable you to crave the freshness from fruits and vegetables. As we all enjoy life and many social events sometimes they can impact our systems through food choices and a few too many cocktails to which, may impact the adrenal glands leaving us to feel tired, stressed, and flat. This is where a master cleanse comes in! Through the potent amount of green vegetables and vitamins such as: B vitamins, Vitamin C, Vitamin E and Magnesium to name a few, this cleanse may encourage adrenal support, healthy digestion, reduce inflammation, increase energy levels, improve skin and help you feel light again. The master cleanse is also fantastic for improving mental clarity. During the Master Cleanse you may wish to participate in yoga to increase your overall experience. Yoga will help to increase muscle strength, boost immunity, assist in healthy digestion as well has ensure a restful. The combination of the two is a fantasist way to give your body the ultimate master cleanse!